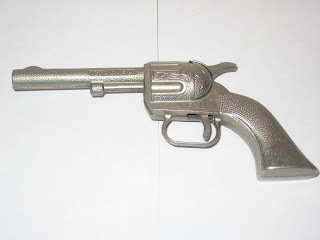 Carrying on the topic of vintage gifts, I am sharing a picture of a Hubley Toy Gun we own, it was given to us as a gift, and really makes a great gift for dad. It measures just under 6 inches in length and based on some preliminary research we think it dates to the 1950s - obviously this makes it a gift over 50 years old! We hope you enjoy the photo!